The John Green Food Service Building is where the University’s food is processed. This building contains a 5,986 sq. foot bakery, and has a storage area of 448 sq. feet, with a 25 foot high ceiling for a greater capacity of frozen food. There is also a testing kitchen for products and room for classroom instruction of food personnel. 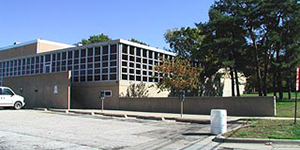 This building was opened in 1968 and named after John W. Green. Green was an emeritus Assistant Professor of Agriculture. He also served as food service manager for the navy unit located in Fell Hall from 1943–45.